Visit our GoFundMe page. We are looking to raise $10,000 dollars. To provide informative content of African Peoples contributions to world history and their development of civilization. To provide an archive of African centered researchers, historians, scientists, lecturers and activists. To use its 30,000 hours of research and documentation to structure a chronological overview of African history from the origins of humanity, to issues and events of today. The benefits of such an archive to both African people and the world are profound. First, it will change the way African people see themselves and second, it will change the way the world sees African people. Perception is critical to how we see and treat one another. Perception has a profound impact on what we believe and therefore, what we believe we can and cannot do. Perception has a direct relationship with two primary components - Images and Information. Whoever controls the images and the information, control the perception. Because of the enslavement of African people, they lost their names, their language, their nationhood, their history, and the confidence of their own ability. They were forbidden to speak in their language or practice their own culture. Over time, they were taught by their enslavers that they had no history and that they were inferior to white people. They were severely punished if they were caught trying to read or write. Yet, in spite of the enslavement and oppression, African people made profound contributions to every aspect of the development and growth of America. Not only did Africans provide the free labor to build this country, but Benjamin Banneker, an African American was key in the design of the White House and the design of Washington DC as a city. Africans made great contributions in all areas of modern scientific development. The filament of the first Light bulb was designed by Lewis Latimer. Refrigeration, Medicine, Aerospace, Electronics, Automotive design, etc., Black people have made contributions to every fabric of American technology. Black soldiers fought and died in every war in American History. In fact, the first blood shed for this country was the blood of Crispis Attucks, whose death at the hands of British soldiers led to the American Revolutionary War of 1776. Furthermore, America would not be America as we know it, had it not been for the 230,000 African Slaves and Freemen who joined the Union Army from the North, which brought about the defeat of the Confederate troops of the South. It is because African history has been distorted and in all too many cases, omitted and falsified, that there is a critical need in particular at this point in history to make that correction. When white children walk among the massive skyscrapers of New York City, they look up and see the great engineering of these structures, and they say "Look what my forefathers did!" They are inspired, motivated, and instilled with confidence that they too can accomplish the same. For an African child to be aware of the great contributions of his ancestors, it would have the same inspiring benefit of confidence and motivation as the white child who sees and is taught the legacy of his ancestors. There is not one thought that is in the world today that was not contemplated by our African forefathers - What is life? What is Death? How do we live together in peace and prosperity? Not only did Africans seek answers to every question imaginable, they found answers that brought about the spoken word, the mother tongue of all languages. They were the first to create art, music, science, mathematics, internal medicine, government, law, engineering, animal husbandry and the mortuary sciences. They were the first to adorn themselves with cosmetics and the first to cultivate cotton and adorn themselves with diverse fashions of clothing. These are the people who brought forth the natural sciences including biology, chemistry, physics and astronomy. Most significantly, they invented the art of writing. Every alphabet used today is based on those created by the Ancient Egyptians.
" The Great Temple of Karnak in Luxor.
" The Royal Tombs at the Valley of Kings.
" The Mortuary Temple at Deirel-Bahri and Remesseum.
" The building of boats for long distance travel. These monuments and inventions collectively embody all scientific and mathematical principles previously mentioned and are the foundation for all modern mathematical and scientific principles, even those yet to be discovered. Africans throughout the diaspora and African descendants in America in particular are very much like the Baobab tree throughout the African Continent - Strong and beautiful, but with their roots severed, they cannot grow and may not last long. They must nourish themselves by being rooted in the accumulated knowledge and wisdom spanning over tens of thousands of years and traces back to the first man and woman made by our creator. It is this great body of knowledge and wisdom that is the foundation of how the world operates today. The African worldview and value system is the essence of this great body of knowledge and wisdom. In Ancient Egypt, this value system was known as Maat - meaning Truth, Harmony, Balance, and Justice. Maat also as the foundation of mathematics, which is the language of the universe. 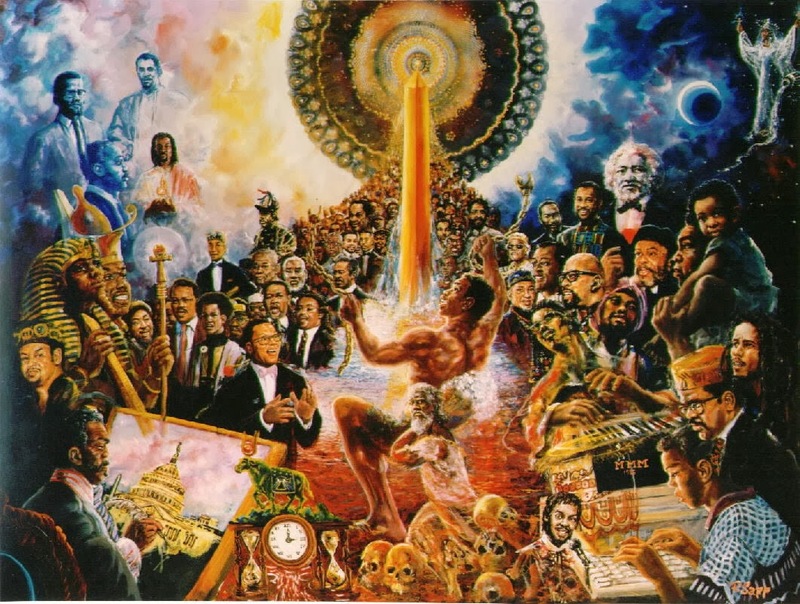 The Ingenuity and achievement of Ancient Africans and her descendants have proven that they are necessary in solving the crises of today Through the African Mind rooted in the principles of Maat, The African world view is a gift offered to the world at a critical time when world civilization must save itself from self-destruction. This archive is a tool to help heal the African Mind and help free it so it can pursue the task of creating a world of peace and prosperity for all people.